What is Bezalip Retard SR (Bezafibrate) used for? Bezalip Retard SR (Bezafibrate) is an oral medication prescribed along with a balanced diet and regular exercise to treat patients with high cholesterol or triglyceride levels in the blood. It operates by stimulating the actions of certain enzymes in the blood to breakdown cholesterol and triglycerides. This action reduces the accumulation of these fats in the blood vessels to prevent heart disease, heart attacks, or hypertension. Your doctor may also prescribe it to be used along with other medications or for the treatment of other unlisted conditions. How should I use Bezalip Retard SR (Bezafibrate)? Bezalip Retard SR (Bezafibrate) should always be used strictly according to your doctor`s instructions to get the safest and most effective results from treatment. The typical dosage is one daily administration of one tablet, but your individual directions will be based on your age, weight, health condition, and the severity of your symptoms. These should be swallowed with a large glass of water and may be taken on an empty stomach, unless otherwise directed by your doctor. Do not crush or split the tablets prior to use as this may destroy or change the effects of their contents. What are the side effects of Bezalip Retard SR (Bezafibrate)? Serious side effects that may require immediate medical attention include muscle pain, tingling sensations, pancreatitis, formation of gallstones, decreased blood cell count, pancreatitis, cholestasis, or signs of an allergic reaction including hives, swelling, or trouble breathing. Inform your doctor as soon as you experience any worrying or intense side effects to make sure the necessary adjustments are made to your dosage or application frequency. Bezalip Retard SR (Bezafibrate) should not be used by patients who are pregnant, breastfeeding, lactose intolerant, children, allergic to other fibrate medications, or who have gall bladder disease, nephrotic syndrome, or reduced kidney function. Also inform your doctor if you have hypothyroidism, drink large amounts of alcohol, have a severe infection, hormone disturbances, porphyrias, decreased liver function, or if you have experienced muscle pain when taking other fibroid medicines. These conditions may lead to unexpected health problems requiring adjustments to your regimen. 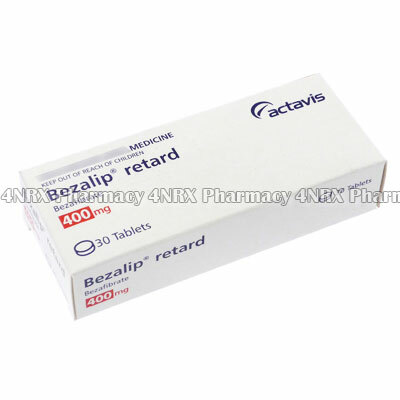 Strictly use Bezalip Retard SR (Bezafibrate) as prescribed and follow all instructions provided by your doctor. Safe, suitable, and optimum dosage can vary and is dependent on the patient`s health and medical history, as well as the condition you are treating. Bezalip Retard SR (Bezafibrate) may not be safe or suitable for all patients. Always ensure your doctor is informed if you are using any other type of medication (including non-prescription medicine, vitamins, and supplements), as well as if you have any allergies, other illnesses, or pre-existing medication conditions, especially liver, kidney or gallbladder diseases.